The IADC North Sea Chapter once again recognized the very best in safety performance at its annual Safety Awards Ceremony held in Aberdeen on 16 May. In his address, IADC President and CEO Stephen Colville emphasized the importance of improving the competency of people, as well as the effectiveness of processes and efficiency of equipment. “It is vital to drive down costs of operating in the North Sea,” he noted. Mr Colville cited the tax raid on drilling contractors announced in the recent budget as demonstrating the conflict between the government’s reasonable expectations for inward investment and higher safety expenditure and the unreasonable actions of increasing taxes on contractors. Awards were presented to companies and installation for their safety record over the last year. 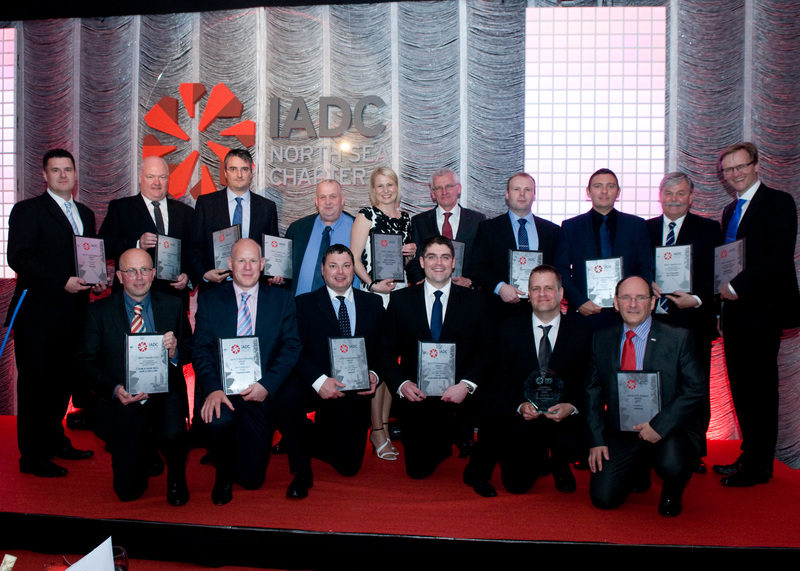 IADC North Sea Chapter Safety Award Winners and Runners-Up. Back Row (Left to Right): Mark Cowieson, Archer; David McMillian, Noble Drilling; Rob Vander Lan, Noble Drilling; Dave Pirie, Archer; Gunni Walker, North Atlantic Drilling; Eddie Fowler, Odfjell Drilling; Andrew White, Stena Drilling; Grant Stevenson, Stena Drilling; Paul Horne, KCA Deutag; Arild Pettersen, KCA Deutag. This year, awards based on safety performance in 2013 went to Northern Offshore and Noble Drilling in the Jack-ups category; Transocean in the semi-submersibles category, Archer in the platforms category and Stena Drilling in the Drillship category. Merit Awards for outstanding safety performance over a number of years were presented for drilling operations on the Captain (Archer), Kvitebjorn and Oseberg C (KCA Deutag), Noble Hans Deul and Noble Julia Robertson (both Noble Drilling) and West Alpha (North Atlantic Drilling). The Environmental Award went to Stena Drilling and the Associate Member Award was presented to Sodexo. The Chairman’s Special Award, presented to someone who demonstrates strong safety leadership, went to Stuart Hepburn of Archer. The recipient of the Val Hood Award, established in the memory of a late colleague to recognize the contribution of a person or organization to the industry, was the Royal National Lifeboat Institution, a group reliant solely on charitable funding for their invaluable work. A check for £15,000 was presented to Lin Wood representing RNLI. Funds raised on the evening will be donated to CLIC Sargent and Macmillan Cancer Support. 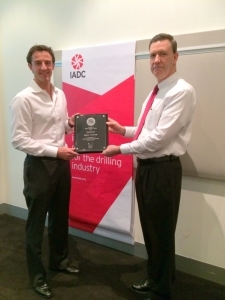 In 2014, after a 3-year hiatus, the IADC Australasia Chapter reinvigorated its Safety Statistics Award Program to recognize member companies with exceptional safety records. In 2013, 13 of the 16 IADC Australasia Chapter member companies participated in the program by supplying quarterly safety statistics. On 8 April, the chapter presented the Onshore Award to Parker Drilling Company and the Offshore Award to Transocean. IADC’s Mike DuBose presents Julian Soles of Transocean the 2013 Offshore Award. The WCI Executive Board approved a new WCI initiative on 7 May at its inaugural Executive Board meeting. The WCI’s new initiative aims at developing a comprehensive map of well control efforts worldwide. Executive-level representatives from many leading companies participated: BP America, Cameron, Diamond Offshore Drilling, Helmerich & Payne, KCA Deutag, Maersk Drilling, Murphy Oil, Noble Drilling, National Oilwell Varco, Petrobras, Precision Drilling, Saudi Aramco, Seadrill and Shell International E&P. For more information, please visit the WCI Website. On 20 May, the IADC Houston Chapter donated $40,000 to Home Run Hitters International, which creates interaction and meaningful communication opportunities for children with disabilities. Money for the charity was raised at the Chapter’s annual Dinner Dance and Silent Auction on 7 February. The chapter also donated an additional $55,000 to the Oilfield Christian Fellowship of Houston, which distributes bibles throughout the industry. Money was raised at the Chapter’s annual Oilmen’s Christian Charity Shoot on 7 March. 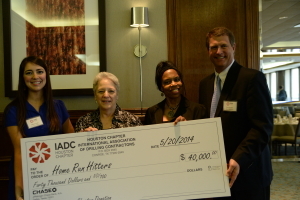 Left to Right: Allison Fraser, Rowan; Marcy Sandell, mother of a Home Run Hitters student; Dr. Deborah Carr, Home Run Hitters and Scott Gordon, Derrick Equipment Co.
For more information and to get involved, please visit the IADC Houston Chapter website. Coercion of Commercial Motor Vehicle Drivers; Prohibition. In the 13 May Federal Register, the FMCSA, DOT issued a notice of proposed rulemaking regarding coercion of commercial vehicle drivers. The FMCSA proposes to adopt regulations to prohibit motor carriers, shippers, receivers, or transportation intermediaries from coercing drivers to operate commercial motor vehicles (CMVs) in violation of provisions of the Federal Motor Carrier Safety Regulations and the Hazardous Materials Regulations. In addition, it would prohibit anyone who operates a CMV in interstate commerce from coercing a driver to violate the commercial regulations. It includes procedures for drivers to report incidents of coercion to the FMCSA, rules of practice the agency would follow in response to allegations of coercion, and describes penalties that may be imposed on entities found to have coerced drivers. Comments must be received by 11 August, 2014. Notice of Regulatory Guidance: Automatic On-Board Recording Devices – Effective 5/12/2014. FMCSA issued a regulatory guidance on two issues involving roadside inspection of CMV’s equipped with automatic on-board recording devices to assist drivers with hours of service recordkeeping and compliance. All prior agency interpretations and regulatory guidance, including memoranda and letters, may no longer be relied upon to the extent that they are inconsistent with this guidance. Electronic Logging Devices and Hours of Service Supporting Documents; Evaluating the Potential Safety Benefits of Electronic Hours-of-Service Recorders. The FMCSA issued “Evaluating the Potential Safety Benefits of Electronic Hours-of-Service Records”, a study which quantitatively evaluated whether trucks equipped with Electronic Hours-of-Service Recorders have a lower or higher crash and hours-of-service violation rate than those without. The study aimed at further quantifying the safety benefits of electronic logging devices and provides results that are consistent with the agency’s estimates of safety benefits of the mandate, as proposed on 28 March, 2014. A copy of the report has been placed in the docket, No. FMCSA-2010-0167. For questions regarding the above, please contact Rhett Winter at Rhett.Winter@iadc.org. The US Fish and Wildlife Service is revisiting its proposal from last fall to list a subpopulation of the greater sage grouse found in central California and southwest Nevada as threatened. The service is also reopening a proposal to designate 1.8 million acres as critical habitat to help save the bird, according to a notice published in the 8 April Federal Register. The Fish and Wildlife Service is reopening the public comment period for both proposals, and will accept public input through 9 June. A final determination will be made in April 2015. For more information, please contact Joe Hurt at Joe.Hurt@iadc.org or Bill Tanner at Bill.Tanner@iadc.org.